Wash the fish & drain well. In a bowl mix together, ginger-garlic paste, 1 tsp. soya sauce, oyster sauce, corn flour, sugar, pepper, egg & marinate the fish pieces in this mixture for about 20 mins. Heat the grill pan & grill the pieces of marinated fish using some sesame oil. Keep aside the grilled fish for further use. Heat oil in a wok till hot. Then add grated ginger, minced garlic & green chillies & saute till rawness disappears. To this then add the grilled fish pieces, 1 tsp. soya sauce, a dash of vinegar & toss well. Add the spring onions & keep tossing continuously. 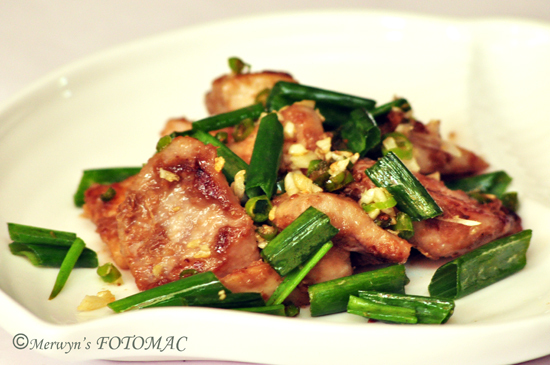 Serve hot garnished with some more spring onion greens. Enjoy as a starter or on the side with fried rice or noodles. You may add shallots & capsicum if you wish. If you like it very hot & spicy then retain the seeds of the chillies. Note : Sauces contain salt so use salt sparingly.